This painting is listed as being by J. M. W. Turner and is inscribed on the reverse. We would be interested in knowing people's thoughts as to the attribution. It is dated 1819 and was accessioned by us in 1943. This painting is now listed as after Joseph Mallord William Turner (1775–1851). The execution date has been updated to c.1860–1910, and a painting description has been added. Thank you to all who contributed. Please see below for all the comments that led to this conclusion. Attached is an image of the reverse of the painting. The first thing that would help is a good image of the back and of all inscriptions and labels. 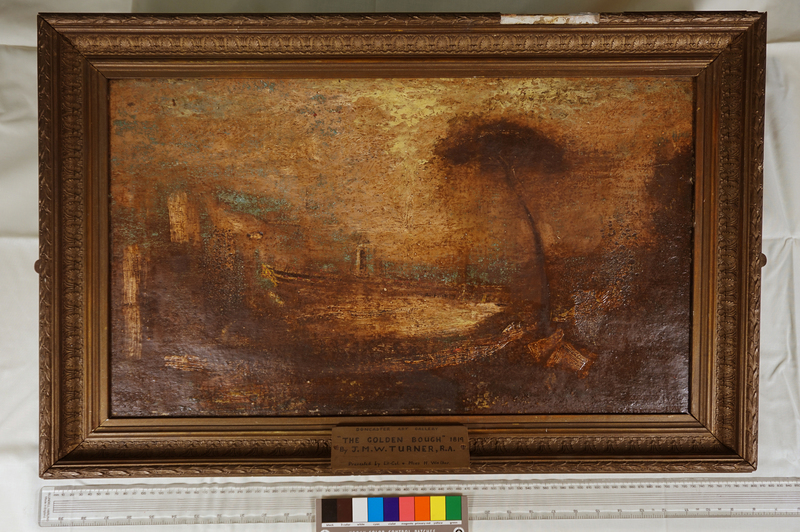 The composition approximates to that of Turner's 'The Golden Bough' (Tate N00371), exhibited 1835. There is a watercolour sketch in the Tate ( D25446, Turner Bequest CCLXIII 323), dated to c.1820-30, and at least one engraving, by Prior for the Art Journal(? ), c.1860. Any sensible comment on the front of Doncaster's painting would be very hard to make, given its condition and what looks like strange square-brush-stroke overpainting. The image of the reverse does not seem to be attached: perhaps the collection could re-post please. In the meantime, I would say the attribution to J.M.W. `Turner was over-optimistic -- even allowing for the painting's apparently damaged condition. Can Doncaster send image again please? Dear Andrew, many thanks for your comments. 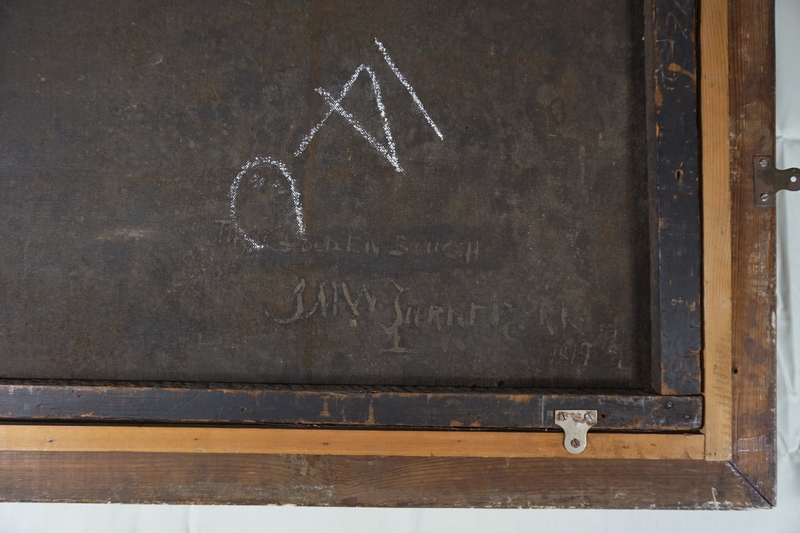 I am afraid that there are no further labels or inscription on the back of the painting. The image from Doncaster Museum Service is attached here. New to Mac computer...I can't see those strange square brush strokes...but the palette highlights is right for L. S. Lowry. Then the framing in the reverse image is pure Lowry...see those ££££ signs? and disguised clues. Mr. Lowry reworked many old masters for practice and pure pleasure and had to hide his 'out of hours works' not signing most but leaving clues. He seems to have needed to see his works on public display. Perhaps thumbing his nose at the Art Establishment again with this picture? Such a source could explain the greater contrast between light and dark areas in the Doncaster painting than in Turner’s original. Thanks to all for the constructive comments. It seems that as we suspected that the work is probably 'After Turner', and possibly, as has been suggested, after an engraving of the original painting. We are though intrigued by the reference to L.S Lowry, and would be very happy to hear more from Mr Rann, if he would like to get in contact with us. The Prior print certainly made the picture well known and -in London at least- it got an unusual compliment when William Gordon copied it as a stage scene in Charles Kean's production of ' 'A Midsummer Knight's Dream' at the Princess's Theatre in Oxford Street -one a a string of celebrated Shakespearean revivals he did there in the 1850s. Such use of gallery paintngs as the basis for stage scenes (or tableaux) was not that unusual:there were well-known examples after Wilkie, Eastlake and John Martin- but it didn't often, or at least so obviously, happen with Turner. I spent some time with Butlin and Joll (1984 edn) this morning. Firstly, they helpfully illustrate a signature of 1818, which bears little relation to the purported 1819 signature on the back of the Doncaster painting. In any case, as Richard Green has explained, there is no reason for Turner to have signed an oil sketch. Even less, the title, as it is highly unlikely that he would have already titled an 1819 a compositional sketch used for a painting he did not make until 1834. The inscribed title appears to be an overpainted inscription. Both title and ‘signature’ may well be in the same hand, suggesting both an erasure of an earlier inscription and the addition of a signature. The conclusion must be that the inscription and signature are false. Turner of course made very many oil sketches and studies, some for particular paintings, some as compositional and colour studies for use and inspiration later. The group of oil sketches that most resemble the Doncaster painting are those made on or after Turner’s Italian trips of 1819 and 1828. Those of 1819 are mostly watercolours, and the oil sketches of classical landscapes dated by Butlin and Joll to c.1828 are mostly on muslin stretched on millboard. They are notable of course for Turner’s mastery of materials and technique and for his knowledge of natural forms, including trees, however idealised and simplified. These qualities are hard to discern in the Doncaster work. An example of a comparable (but cleaned) Turner composition would be ‘Lake Nemi’ (Tate 3027, http://artuk.org/discover/artworks/lake-nemi-202423). Interestingly, I did notice similar broad white highlights on ‘Hill Town on the Edge of the Campagna’ (Tate 5528, http://artuk.org/discover/artworks/hill-town-on-the-edge-of-the-campagna-202513), but those on the Doncaster picture seem rather unrelated to the underlying subjects. It is therefore possible the artist was familiar with Turner’s oil studies. I am not sure when any of these were first exhibited. The Doncaster painting is hard to judge because of its poor condition, but there seems no reason not to conclude, as Richard and Pieter have, and formally recommend that this is ‘after Turner’ and probably derived from T.A. Prior’s c.1860 engraving of ‘The Golden Bough’. Unless obviously faked to look old, the canvas and ‘stretcher’ look 19th century, so a date of c.1860-1910 might be appropriate. Any chance of a better photo? Thanks. Bendor, is this any better? If not we have some details we could send you. Please note there is a 6MB limit on uploads, which is why they were not uploading before – these have been reduced in size so they can be uploaded. As the higher-resolution images have not prompted any further comments, I suggest, Andrew, that this discussion could now be closed on the basis of the formal recommendation you previously made. The two group leaders are agreed that we can formally recommend that this is ‘after Turner’ and probably derived from T.A. Prior’s c.1860 engraving of ‘The Golden Bough’. Unless obviously faked to look old, the canvas and ‘stretcher’ look 19th century, so a date of c.1860-1910 might be appropriate. 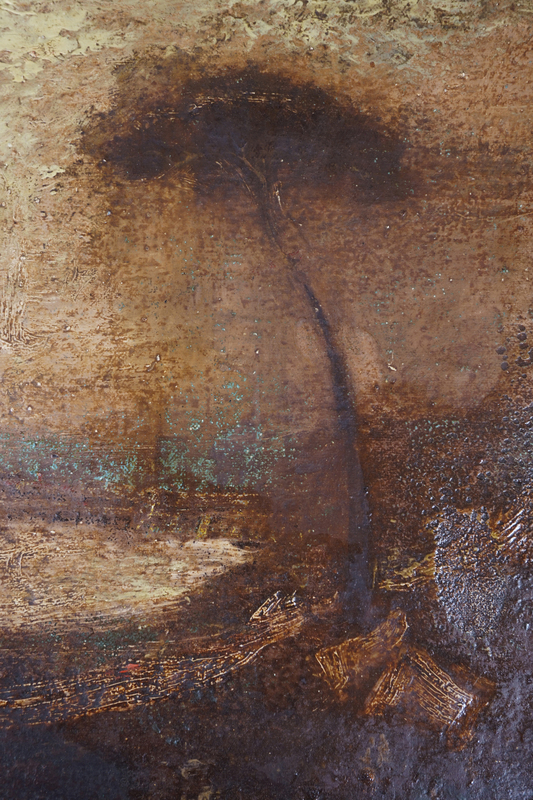 This painting is probably derived from T. A. Prior’s c.1860 engraving of ‘The Golden Bough’ after Turner.